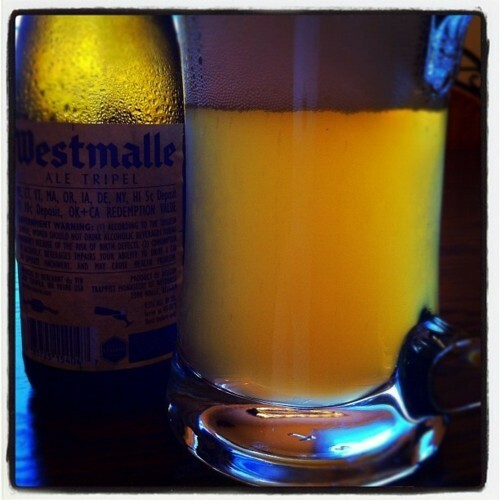 For my fiftieth review, I’ve chosen to take a look at one of the most revered beers around, Westmalle Tripel, a beer made by Trappist monks. 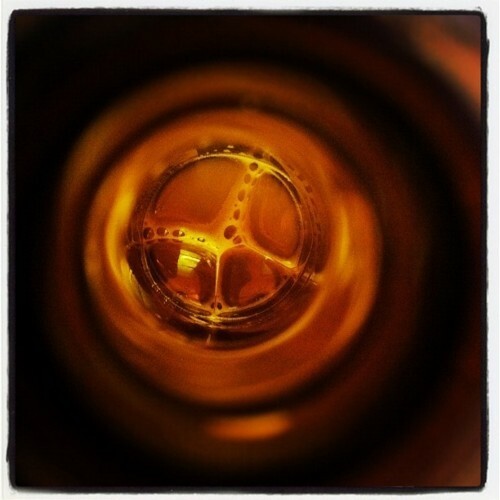 Since this is the first review of a Trappist ale on this website, a bit about what a Trappist beer is: Of the 174 Trappist monasteries worldwide, seven of them produce beer as a means of financial support and for good causes. Six of them are located in Belgium while the other is in the Netherlands. The beers by the seven monasteries are marked with an authentic Trappist logo so there can be no confusion as to if it’s genuine or not. The brewery, the choices of brewing, and commercial orientations must obviously depend on the monastic community. The economic purpose of the brewery must be directed toward assistance and not toward financial profit. Westmalle Tripel, produced by the Westmalle Brewery, is considered the first strong pale ale to use the term ‘Tripel.’ Created in 1934, this beer is widely copied — it uses pale candy sugar and Styrian Goldings hops. The recipe has not changed since 1956. Westmalle Brewery employs twenty-two monks and forty secular workers; the operation is capable of bottling 45,000 beers per hour. The Trappist Abbey of Westmalle also produces milk and cheese. According to the Westmalle website, they advise you to leave a bit of the beer in the bottle after the pour as this contains the yeast base. Apparently, the yeast left behind is rich in vitamin B and has a “blood cleansing effect.” I couldn’t tell you if that is true or not, but I’m going to try it (usually I just pour the entire bottle in, yeast be damned). Westmalle Tripel produced a head that could very easily get out of control, if your temperance lets it; the foam here was huge and billowed out of the glass, so much so I had to stop mid-pour and allow things to calm down before completing the task. 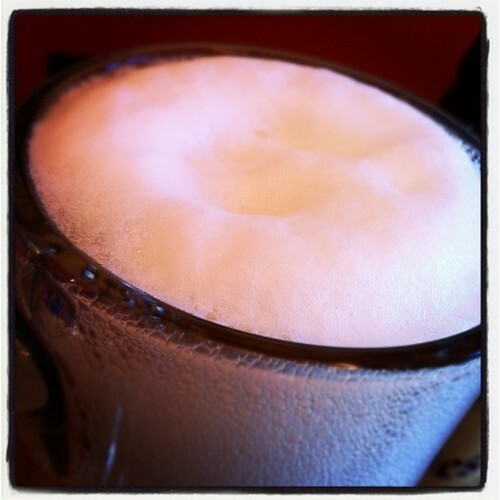 The head was at first dense but turned rocky and creamy as it sat, settling in to a thick cover on top of the liquid. The color of the beer is bright golden yellow with hundreds of bubbles quickly rising to the surface. The body was clear with a few particles floating around, and the lacing was sticking to the glass in thick wads. A gorgeous, perfect scoring beer in appearance. 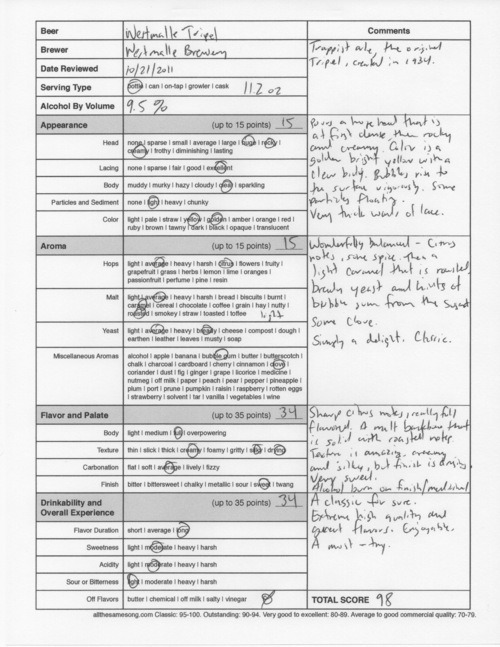 There wasn’t much difference in the aromatics. This beer is perfectly balanced, with just the right amount of hops, malts and yeast present. There’s an overwhelming citrus aroma balanced with some light caramel and roasted notes, then a bready yeast. There are hints of bubble gum from all the sugar used, and there’s a nice nondescript pepper-type spice and clove. The taste is dominated by the citrus component, specifically orange. But it’s a complex orange; you get the juicy, ripe fruit, then on the finish you get the slight bitterness of the rind and a hefty portion of the zest, as well. There are light caramel flavors that are generally roasted, and the finish is quite long and starts out sweet but ends up more toward the bitter end, with a nice alcohol warming effect as everything goes down. 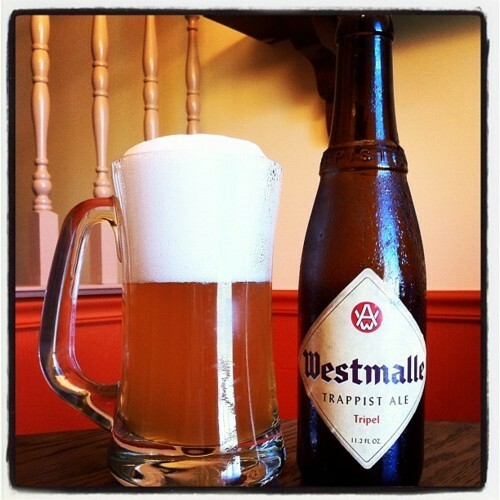 Westmalle Tripel is on the higher end of the alcohol content, coming in at 9.5% ABV (alcohol by volume). It can’t be overemphasized how great the texture of this beer is — it’s silky and creamy with a fair amount of carbonation, but dries the mouth out just enough to suit the flavors and finish. World class. This drink absolutely ranks as a classic and is probably the go-to Tripel. I took two points off my rating, and here’s why: For my tastes, I would have loved to have seen a bit more complexity in the malt flavors, and I thought the alcohol warming sensation was great but a bit too medicinal. By no means, don’t let that stop you. This is a great beer all lovers of the ale should try. Westmalle Tripel, 98 points. Price: $5.79 US for one 11.2 ounce bottle. The appearance of the beer was certainly different, going from light particles and sediment to very cloudy and full of particles. But did it affect taste? 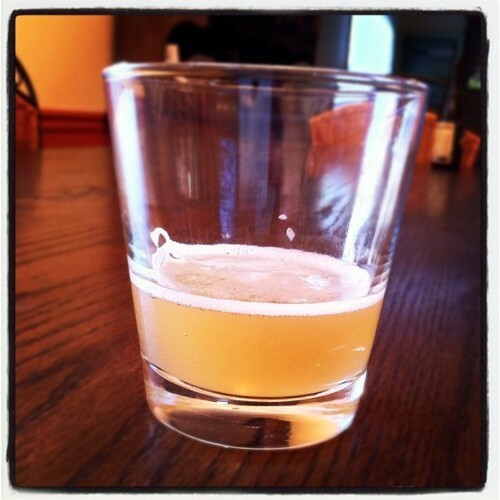 I think it definitely did — the bottom ounce or so of the beer that contained all the yeast was worlds more bitter than the clear pour. Did I feel invigorated after drinking it, ready to take on the world with freshly-cleansed blood? Honestly, I felt a bit tipsy after drinking this one, due to it’s relative high ABV and an empty stomach. Maybe I’ll rise tomorrow with the ability to bench press eight times my weight — stay tuned!